While located within the Independence Botanical Gardens, the Baton Rouge Garden Center is owned and managed by the Baton Rouge Garden Club. For information regarding renting the Center for meetings, receptions, shows, etc., contact the Center directly at 225-928-2270. TheIndependence Botanical Gardens were created in 1991 and is dedicated to horticultural education, recreation and nature studies. It is still a work in progress. BREC and the Botanic Garden Foundation, a volunteer organization working in partnership, are adopting an evolving Master Development Plan for the Botanical Gardens. The Botanical Gardens are being constructed in phases as funds become available. Volunteers do much of the work in planting and maintaining the specialty gardens while BREC employs a landscape crew that maintain the grounds. History of the Land: Independence Park originally was a part of the Goodwood Plantation, purchased in 1931 by East Baton Rouge Parish and used as an airport. The downtown Airport, as it was known, operated for 44 years and closed in 1975. The City Parish Council designated a part of the original 200-acre airport site to BREC for a public park. Independence Park was developed following BREC’s Master Plan and dedicated in 1976. In 1988 Baton Rouge Green raised funds to revise this plan to include a 15-acre site for a proposed botanic garden. Following the establishment of the revised Master Plan in 1988, a collaboration of various plant societies, organizations and garden clubs joined together to form what was known as the Botanic Garden Council and sponsored the development of the initial gardens now contained within the Botanical Gardens. The collaboration later organized and became incorporated in 1993 under the name of Friends of the Garden and in 2000 re-filed as The Botanic Garden Foundation at Independence Park. The Foundation, comprised of community volunteers, works in partnership with BREC to oversee the gardens, raise funds for development and provide educational opportunities for the public. The general public is welcome to attend any of the quarterly held meetings of the Board of Directors. A main attraction within the Garden, it is the place where city garden clubs, horticultural organizations and interested citizens hold flower shows and special garden events. The Garden Center was built and is owned by the Baton Rouge Garden Club. The facilities may be rented for other events such as parties and receptions. For information, contact the Garden Center office at 225-928-2270. This Garden is sponsored by the Baton Rouge Landscape Association (BRLA). They grow and care for over 250 plants and over 40 varieties in this one-of-a-kind southern garden. It is designed by color, showing reds, pinks, whites, lavenders and purples. Among them are miniature, dwarf, semi-dwarf, medium and tall varieties. The garden provides a location in the city where visitors can study the large variety of crape myrtles available for planting in Baton Rouge and the South. Members of the BRLA, who are in the landscape business, provided the plants, installed them at the site and maintain them on a periodic basis. The collection is used by BRLA to give class instruction in proper pruning and fertilization of crape myrtles, the official tree of Baton Rouge. The Sensory Garden initially was established and sponsored by the Herb Society of America, Baton Rouge Unit and features a wide variety of herbs and other plants used for food or seasoning. The various plantings and features stimulate the senses of taste, touch, smell and hearing. This garden is sponsored by the Baton Rouge Rose Society. The Rose Garden consists of a parterre of over 400 rose plants that display the full range of rose species, including hybrid teas, floribundas, polyanthas, old garden roses and miniatures. The center of the garden features a garden pavilion in which visitors may sit and observe the flowers. Special education programs are presented by the Baton Rouge Rose Society and individual members care for the plants and garden. 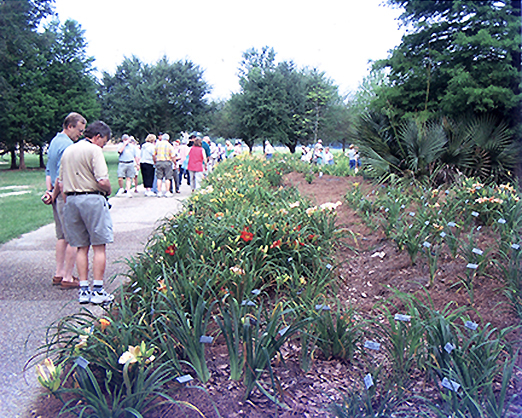 The garden has been built to display the five native species of Louisiana Iris, along with the many unique hybrids that have become available in recent years. The original collection within the garden was dedicated to Joseph K. Mertzweiller, Iris hybridizer and creator of tetraploid Louisiana Iris known as the "Professor" series. More recent varieties include B'Darc and Patrick O'Conner hybrids. A large covered Iris Pavilion is adjacent to the iris beds and can be used for open-air meetings and classes or simply to relax and enjoy the view of the gardens. The Daylily Garden was established by members of the Baton Rouge Daylily Society and contains over 800 varieties. It is an American Hemerocallis Society Display Garden. The daylilies are labeled with the cultivars and year introduced. Located adjacent to the Louisiana Iris, the daylilies provide blooms from May through September. This garden, initially established by the Baton Rouge Garden Club, contains plants that attract butterflies and host plants to receive butterfly eggs and provide food for the larvae to grow to mature butterflies. It is located at the start of the Promenade across from the Baton Rouge Garden Center. These are located under the oak tree adjacent to the Daylily Garden. 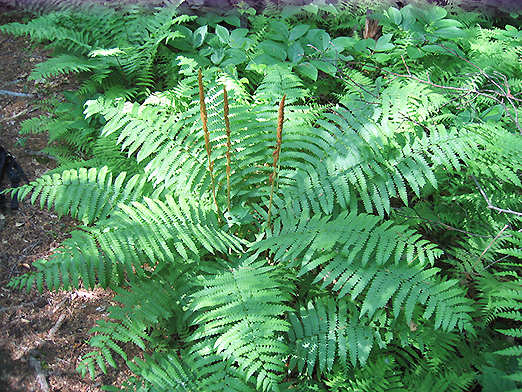 Sword fern, Autumn fern, Maidenhair fern and Holly fern are inter-planted with Root Beer plants to complete an interesting display. This collection has types of gingers that do well in Louisiana. 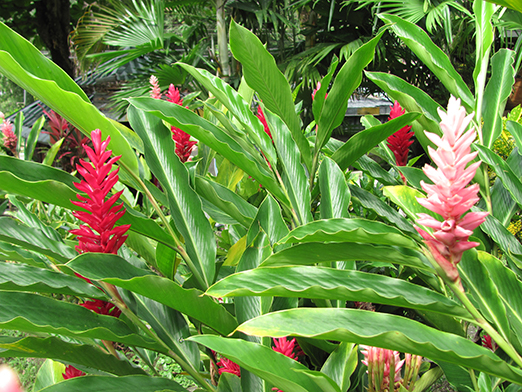 These are tropical plants that are root hardy during our winter season. Located on either side of the Sensory Garden, it provides blooms in a wide range of color from July through September. This garden fronts the site and runs along Independence Boulevard. This project received funding from Exxon and YWCO and was sponsored by Baton Rouge Green. Plantings of several hundred live oaks and crape myrtles were installed during the spring of 1991. The Promenade, designed by Abbey Associates Landscape Architects, features a “double triple column” of live oaks, the only planting of its kind in Louisiana. Reservation Fee is Non-Refundable. Balance of Fees and Damage Deposit are due within 30 days. Any refunds require 90 days notice of cancellation. For garden clubs, garden shows, meetings during the week, other hourly rates apply. Due to limited office hours, please leave voice mail when calling or send Fax. Garden Center Hours of Operation: Tuesday & Thursday, 10 a.m.- 1 p.m. The Library Board and BREC are working together to integrate the Botanical Gardens and the grounds of the new Main Library. The area between the library entrance and the Botanical Gardens was designed to be a dynamic area that meets the many needs both of the park and of the library patrons. The area is meant to be a vibrant space that celebrates and enriches both entities. The Botanical Gardens is continuing to grow and improve. New and expanded gardens are included in the plans, but much is dependent on the availability of funding. Volunteers are always needed to work in the gardens. Become involved! Make a financial contribution of $10 a year to become a member of the Friends of the Garden. For more information, please contact us at the above listings. “A garden to walk in and immensity to dream in--what more could he ask?